The spiritual life of Padre Pio divides itself somewhat artificially into three periods of development although no neat demarcation separates one from the other. St. Bonaventure's spiritual classic - On the Threefold Way - describes these three stages of the soul from the purgative through the illuminative way to the unitive way, culminating in the state of ecstasy. All three periods are found in the spiritual development of Padre Pio. In the experience of the mystic these purgative states are unbelievably intensified and words are inadequate vehicles to describe the fires of purification into which he is plunged. 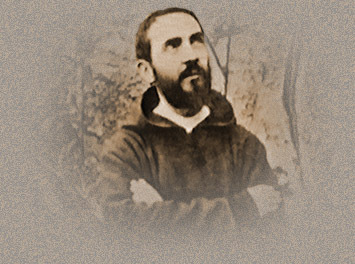 The purgative period of Padre Pio's life may tentatively be assigned to the outset of his religious life when he received the novice's habit in 1903. Externally, of course, this is a testing time during which the religious community determines the fitness and aptitude of the novice who, in his turn, makes serious trial of the life to which be believes himself called. On another level the purgative way of Padre Pio calls forth to the utmost the generosity of the novice and in the case of the saints it is not uncommon during this time for such generosity to exceed the bounds of moderation. It is the time of detachment from all sin, a breaking with creatures to live for God alone. We know that such practices as fasting, vigils, solitude and various other mortifications played an important part in Padre Pio's spiritual development at this time, strengthening him in virtue and liberating his spirit from all selfishness. The Franciscan ideal makes severe demands upon Padre Pio who would attain to union with God: natural desires, even their first movements must be suppressed. One incident highlights the generosity of Padre Pio at this time showing the spirit of abandon with which he entered upon his new life. Never very robust at any time it appears that the young Padre Pio 's health was undermined from the severe mortifications to which he subjected himself. So much so that his parents on visiting him at the end of this same novitiate year were visibly shocked by his emaciated appearance and thinking him to be very ill wished to take him home. Another incident a few years later at Venafro gives some indication of the sort of progress Padre Pio was making. Here it is recorded that he once lived for 21 days with no nourishment save that of the Eucharist. It is highly interesting to observe that in later years Padre Pio was never to depart from the severe ascesis of these early days. If anything, he greatly increased his austerities for it was regarded as miraculous that a man could live as he lived on so little nourishment and sleep. Later, after the purgation of sense and with his soul strengthened by grace, fresh trials of a more passive nature further tested the young Padre Pio. Well known here are those strange illnesses, the mysterious hyperthermiae (high temperatures) which came and went with alarming suddenness; often, too, the fragile state of his health with the ever present danger of tuberculosis meant frequent returns to his home in Pietrelcina for periods of rest. It was on one such return that Padre Pio after his ordination first received the invisible stigmata. Besides illness and physical sufferings other trials of far greater torment must be undergone by the mystic. St. John of the Cross has vividly described these under the image of "night". After the senses have been purified in the "Night of Sense" the mystic after some time now enters upon the most difficult of all trials - the Night of the Spirit. There is no telling how long this lasts but spiritual authors agree that the greater the mission of the person concerned and the higher the degree of union and contemplation to which he is invited then so much longer are the trials and sufferings. With Padre Pio this painful period appears to have lasted several years after his ordination. In the Night of the Spirit it is God Himself who assails the soul in order to renew it in the image and likeness of His Son; He permits all manner of evils to befall the mystic so that the man feels himself completely abandoned, cast off from God, victim of the devil, and subject to every kind of temptation and bitterness. This should not be surprising, says St. John of the Cross, considering the high station of contemplation to which the mystic is being called. We can gather some faint idea of what God was working in the depths of Padre Pio's soul from the letters of this period. Speaking of his own sinfulness and wretchedness he says: "How difficult, Father, is the way of Christian perfection for a soul so ill-disposed as mine. My badness makes me fearful at every step I take" (4.7.1915). In this state of soul God often withdraws his presence for long periods and the sufferer can even believe himself lost: "Peace has been completely banished from my heart. I have become absolutely blind. I find myself enveloped in a profound night and no matter how I turn and toss I cannot find the light. How then can I walk before the Lord ? ... He has rightly thrown me among the everlasting dead whom He no longer remembers". God permits, for the good of His servant, horrible temptations against faith when the soul seems no longer even to believe: "My Father, how difficult it is to believe"; and against hope: "It sees itself wholly rejected by the Lord." . To these are added other trials of aridity and desolation through which the mystic Padre Pio enters more deeply into the knowledge of his own wretchedness before God and in the end feels himself forsaken by all. The devil too is let loose to plague the soul by all manner of diabolical temptations and illusions, in fact the mystic comes to feel himself so abandoned by God that he wonders whether all is not simply the work of Satan. Padre Pio writes to his director: ". - if you find that I have been the victim of that horrid thing (the devil), I beg you, Father, for the love you bear Jesus, be good enough to illuminate me". But even though the sufferings are so painful that death itself would be a relief: "I ask for death as a relief for my afflictions... for I can no longer carry on". Nevertheless every so often the Lord lets His light shine into the soul, clasping it in an embrace of infinite tenderness and letting it know that all is not lost: "His goodness alone has filled my soul with so many blessings. He hardly ever lets me out of His sight. He follows me everywhere: revives my soul so poisoned by sin, destroys in me the dense clouds in which it was enveloped"
And so the work goes on. The Lord in His infinite love wishes to give Himself, but first the tabernacle where he would dwell in so sublime a manner must be made holy. Origen has well described this state as the 41 soul's winter", the time of aridity, desolation and apparent incapacity to love God. But this light which has appeared to the soul as "night" is, in fact, the intensity of God's incandescent fire, illuminating and bedazzling the soul with the majesty of His divine splendour. Nature must first be stripped of everything earthly and then re-clothed in the celestial garments of contemplative grace. His ordeal over, the mystic now realizes how necessary was this preparation, for no one would dare to live in the divine Presence without first passing through the crucible of tribulation. The Lord Himself, in His eager desire to further enrich the soul, is the sculptor who carves and chisels, refining his masterpiece from the crude block of human nature. And when the mystic finally emerges into the clear light once more he knows for certain that all was the work of God; he knows, too, that even as God had seemed to reject him He was in fact present all the time in the depths of the soul preparing it for yet higher gifts. With the cessation of these trials would it, I wonder, be too fanciful to believe that the highest state of the mystic in this life, the spousal union or mystical marriage as it is commonly called, was consummated between the Lord and Padre Pio on that day in 1918 when the wounds of Christ became incarnate in the flesh of the first priest ever chosen for this privilege? Assaults by the devil were not uncommon to the good Padre. It's as if the devil was aware of the goodness of this man from the beginning in the seminary. The devil would try to intimidate the soul of Padre Pio, tempt him with the most vile scenes and even approach him as the "angel of light" (devil). One day the devil approached Padre as his superior and requested that he cease his prayers and penances. Padre asked this friar to repeat after him....."Blessed Be Jesus!" The "friar" ran out and disappeared, leaving behind him smoke and the scent of sulfur. Satan would make disgusting noises, shouts, screams, and even spite at him and fling him around. There were many physical bouts, which left Padre bruised and shook-up. Obviously, God permitted this for the good of souls and the good of Padre Pio's soul. Perhaps God permitted this for the souls of those who would be his spiritual children or those who would break with the bond of sin. One thing is clear...the devil is real despite the secular thinking of many. Padre Pio had great love for Angels. He had a personal relationship and apparitions with St. Michael the Archangel, his Guardian Angel, and various other Angels. Starting as a child, he would rely oh his Guardian Angel to do many tasks. He petitioned St. Michael to take souls out of the hands of the devil. Padre Pio would call upon his angel to translate other languages, in the confessional and in letters. He would ask people who needed help to send him their Guardian Angel with prayer requests. He told one man that he was up all night receiving prayer requests from the angels. He would say: "May the angels of God open closed doors for you." < Take the First Step to your Spiritual Transformation Now! Get the latest information on Spiritual- Reiki and Energy Healing and receive your FREE Spiritual Healing Session. Let your Inner Power guide You - Subscribe Now!